Spokane is the largest city in Eastern Washington, but it has always enjoyed a friendly, small-town feel. Folks really love living in Eastern Washington's Inland Northwest. Spokane is my home town. THE BEGINNING ~ In 1871, the first white settler to stake a claim in Spokane Falls ("Falls" was later dropped) was Seth Scranton. However, James N. Glover is known as the "Father of Spokane" as he shaped the area bordering the falls into a town. The railroad, timber and rich ore nearby brought enormous wealth ~ making millionaires of many, although a huge fire burned most of Spokane in 1889, slowing its growth. KEY PLAYERS ~ Kirtland K. Cutter, Amasa Campbell, Patsy Clark, Daniel C. Corbin, F. Rockwood Moore, James Glover, Louis B. Davenport, Francis Cook, Aubrey White, J.J. Browne, A.M. Cannon, J.P. Graves, William Cowles and others gave the city its complexion. These highly successful men built grand mansions for their families and imposing downtown buildings to proclaim their wealth. Remarkably, many of these structures are still in beautiful condition. PRESERVATION & THE TOP 10 ~ After World War II, when other cities were tearing down structures, an economic slump had folks here restoring properties. The South Hill in particular is filled with vintage homes built in the '20s, '30s and '40s ~ many as pretty as when originally constructed. Add to that the school system, beautiful parks, manicured golf courses, 70+ lakes, bike trails, ski resorts ~ and the very active Spokane Preservationist Advocates (SpokanePreservation.org) organization. FULL CIRCLE ~ In 2012, Doug and I moved from Seattle back to Spokane. We were both born here, although Doug grew up on Bellevue's Clyde Hill. Fond childhood memories inspired much of the art in this "Spokane Collection" as the community is filled with endless inspiring subjects for an artist like me to recreate. If you grew up here, you'll see dozens of beloved familiar settings below. Highlight ~ Spokane was recently rated among the top 10 cities in the U.S. for its quality of life by AARP Magazine. Many "Baby Boomers" are coming home. SEVEN GROUPS IN THE "SPOKANE COLLECTION"
I've divided this collection into seven groups with sub-categories. Each group highlights neighborhoods, communities and well-known beloved regional areas. In most cases, the artwork revolves with and reflects the seasons and holidays. "THE BIG LIST" ~ At the foot of this page you can link to a complete alphabetical list of ALL the titles with descriptions within the Spokane Collection. Red bold type links you to artwork around the site featured in this SPRING 2019 edition. The Entire Downtown District Collection pdf ~ Click on this 2-page pdf to see all 10 paintings. Spokane’s historic steam plant was designed and built by the renowned architectural firm of Cutter & Malmgren in 1916. Their handiwork and that of later visionaries inspired this art celebrating the setting’s 100th birthday. The plant supplied steam heat to much of downtown Spokane’s businesses for nearly 70 years. When providing this service ultimately became too expensive, Washington Water Power was forced to close it, shutting off the last boiler in 1986. After 10 years of vacancy and an uncertain future, WWP formed Steam Plant Square, LLC. Working with an enlightened team of historic-minded businesses including Wells & Co., life was breathed back into the structure along with two others that were folded into the project. Special care was taken to maintain the Steam Plant’s unique original personality, infrastructure and equipment during the process of creating office, retail and dining space. The iconic stacks on the city skyline were saved for future generations. Highlight ~ The Steam Plant was the first Spokane building to receive the National Preservation Honor Award (2001) and went on to be listed on the National, Washington and Spokane Registers of Historic Places. Reverend Thomas G. Watson arrived in Spokane, WA from Wisconsin to lead Spokane’s initial First Presbyterian (SpokaneFPC.org) congregation in 1883 when Washington was not yet a state. 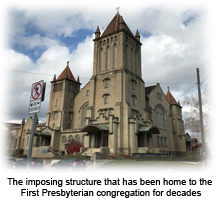 At the time, there was no formal church building, so services were held in various public settings around the community while funds were raised to build a church. The first church was located on Monroe and Riverside, but the newspaper negotiated the purchase of the property three short years later and ultimately the Review Building took its place. The congregation moved temporarily to the Falls City Opera House, which burned down in the 1889 Great Spokane Fire. The second location for a church was the corner of Second Avenue and Jefferson, and ultimately in 1910 to the Gothic Revival-style structure designed by architect Loren Leighton Rand at 318 South Cedar Street. Highlight ~ In 1892, the First Presbyterian Church on Jefferson hosted the funeral of Chief Spokane Gary. Not only did famed architect Kirtland K. Cutter create dozens of beautiful homes and handsome landmark buildings in Spokane, he also lent his design flair to other projects. 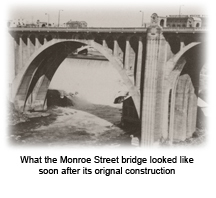 This portrayed the majestic Monroe Street Bridge, which spanned the river at the west end of downtown Spokane. In 1910, John Ralston, Spokane’s city engineer and designer of the grand bridge, invited Cutter to design its decorative handrails and lookout stations, which featured life-size reliefs of bison skulls. The photo here showed the bridge just after its construction. In the background was another famous landmark, the Washington Water Power Post Street Substation. Cutter designed that massive brick and basaltic rock industrial building in 1909. Recently, Huntington Park situated on the south side of the falls was given a formal restoration with the installation of lawn, a basaltic rock terraced gardens and assorted decorative plantings ~ creating a very inviting space for folks to not only view the cascading water, but stay a while and enjoy a picnic in the scenic spot. Highlight ~ WWP’s first CEO, Frank Rockwood Moore, gave Cutter one of his first residential commissions ~ a stunning Turdor-Revival (now demolished) on the property between the D.C. Corbin House and the F. Lewis Clark House which later served as the parking lot for the restored Moore-Turner Heritage Gardens. Famed architect Kirtland K. Cutter designed the Spokane Club (SpokaneClub.org) in 1909, and it has always been a stunning jewel in his architectural crown. The Spokane Club was designed with an elegant interior, featuring a classic formal dining room, ballroom, luxurious street-front bar and hospitable rooms above ~ making the club a wonderful destination for its guests. The later addition of its sports facility has been a huge draw for members who want to stay “in shape” or gear up in winter for the Inland Northwest ski season. Highlight ~ At the time that my parents were members of the Spokane Club, the tradition of their annual debutante ball was still occurring. My sisters and I each were presented to Spokane society on our father Joe’s arm. Entire Spokane Parks Collection pdf ~ Click on this 5-page pdf to see all 19 paintings. Rose Hill at Manito Park (TheFriendsOfManito.org) has always been a romantic spot and one of my favorite Spokane settings in warmer months. Couples walking at dusk, weddings beneath the pergola in spring ~ this setting has been remarkable since Superintendent John Duncan designed the first plans for it in 1941. Additional suggestions from the Rose Society in 1948 included a test garden and memorial roses. Grading began in 1950, the soil was prepared and a sprinkler installed. The award winning Rose Garden was chosen in 1951 to be one of 90 test gardens in the United States by the American Rose Society. Years later, the Dahlia Society shared space there as well, with one of the first of eight test gardens in the United States and Canada. Several beautiful structures were built to enhance Rose Hill. 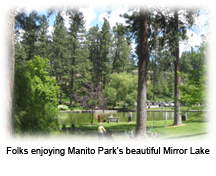 The Duck Pond at Manito Park (TheFriendsOfManito.org) has been altered quite a bit over the years from the setting shown in this artwork. Known in its youth as Mirror Lake (and renamed that recently), it was once nearly twice as large, spreading all the way east to Grand Boulevard. In the early 1900s, there as also a dance pavillion on its shoreline. The lake was a welcome home to the ducks and swans that came to live there during the warmer months. Sadly, the swans were killed in a malicious prank and the signature island weeping willows pictured here were so weakened by the ice storm of 1996 that the park department was forced to cut them down. But the pond has had its revenge, wreaking havoc with some of the homes west of it with its “fingers” of meandering underground streams ~ flooding basements during spring run-off months. Highlight ~ A paved pathway was recently added around theentire perimeter of the lake ~ making it a delightful walk for all ~ rain or shine! Riverfront Park was created as the site of Spokane’s 1974 “Expo ‘74” ~ the first environmental world’s fair. Located on riverfront property that had been a hodge-podge of industrial businesses like the Crystal Laundry, intersecting railroad tracks and the old railway station, the setting was developed into a beautiful park. Some folks thought the historic train station was an architectural gem worth saving. After much discussion, a compromise was reached to keep its signature clock tower. The park went on to house the Looff Carousel, the “Radio Flyer” slide, a pavilion for ice-skating and gondolas that carried folks over thundering Spokane Falls. Highlight ~ Johnny Depp and Mary Stuart Masterson’s classic film “Benny & Joon” included a scene filmed here. The carousel (SpokaneCarousel.org) at Riverfront Park has carried hundreds of riders in merry circles during Spokane’s warm-weather season for decades. I.D. Looff finished it in 1909. It was elaborate in every detail with dozens of multi-sized mirror panels and 180 glittering lights. Too expensive for its original home at Natatorium Park at a price of $20,000, Looff struck a special deal. 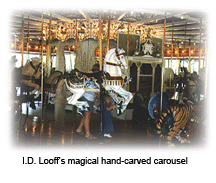 If the park would allow his son Louis Vogel to run the carousel and other concessions on a percentage basis, Looff would ship the carousel to the park as a wedding gift for his daughter Emma. When Nat Park closed in 1968, its property developed into a mobile home park, the carousel was dismantled and stored. 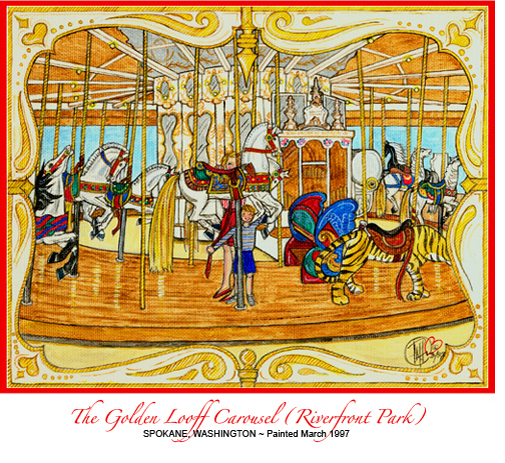 With the opening of Spokane’s World Fair, Expo 74 at 100-acre Riverfront Park, one of the most anticipated events was the re-opening of the carousel ~ not just for viewing, but for riding! Housed in a protective building, this merry-go-round was available again to children of all ages. A few years ago, Spokane's local government asked voters to approve several ambitious improvements to Riverfront Park, one of which was a more robust structure to house the beloved carousel. Once again, the apparatus and horses were carefully dismantled and put into storage. Its new home was scheduled for opening in late spring 2018. Highlight ~ In 2017, I painted a holiday-themed alteration of this piece for Michael Bagley's carousel-themed tree ~ the fifth appearance of my fine art in the Spokane Symphony Christmas Tree Elegance Benefit. 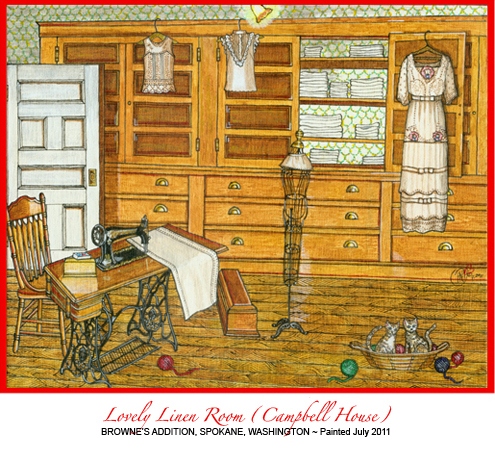 Entire Browne's Addition Collection pdf ~ Click on this 6-page pdf to see all 27 paintings (14 Browne's Addition settings and 13 of the MAC'S Amasa Campbell House). Built in 1896 of shingle and basaltic rock construction, this three-story Queen Anne was located on Browne’s Addition’s west bluff overlooking Latah Creek. Alba J. Page and his wife Flora lived here first, succeeded a short while later by William and Ethel Ufford ~ thus the name. When I painted the Victorian, it had recently been purchased and carefully restored by Katherine Fritchie, who transformed it from a down-on-its-heels apartment house to the classic single family residence painted here. The process was fraught with unique challenges at every turn, but Kathy persevered. After years of neglect, the house shone with its original integrity and was approved for the Spokane Register of Historic Places. I pictured my nieces Isabell and Brooklynn with me in this spring-themed piece carrying a huge pot of hyacinths for Kathy. Highlight ~ Immediately after the Great Depression, folks who owned the large mansions in Spokane's first neighborhood, were pressured to divide their homes into apartments to accommodate returning servicemen. This was the fate of this stucture. Even the wrap-around porch was encased as an apartment. Lemuel H. Wells was Spokane’s first Episcopal bishop. Born in New York, educated at Trinity College and Yale Divinity School, Wells became an Episcopal missionary in the Pacific Northwest, founding the first church in 22 communities. When Washington was divided into two dioceses, Wells chose Spokane as his See. He founded St. Luke’s Hospital and Brunot Hall School for Girls. Amasa Campbell’s daughter Helen is believed to have been a student there. This artwork pictures Spring Baccalaureate. By the time World War II ended, the school was closed and converted into apartments. In 1973, long-time building manager, Jack Magney, angry at being fired when his father sold Brunot Hall, set fire to it with a propane tank ~ shooting two Spokane Police Department detectives and seriously endangering the lives of the tenants. He committed suicide, the building was reduced to rubble in about 2-1/2 hours ~ and Browne’s Addition lost one of its most remarkable historic structures. Highlight ~ I spent a year in a pretty apartment on the third floor west wing of this building in the early 1970s. The charming architectural touches made the stay there special ~ like leaded glass cottage windows with glass handles that opened to the courtyard. Located west of the MAC (Northwest Museum of Arts & Culture) in Spokane’s Browne’s Addition, this beautiful four-columned mansion was a fine example of neoclassical architecture. Designed by Kirtland K. Cutter in 1897-98 for John A. Finch and his wife, Charlotte, it is arguably the most imposing house on this street of grand homes. John Finch was one of young Spokane’s wealthy businessmen, partnering with Amasa Campbell in several successful mining ventures. The scene was afternoon tea time and I’ve pictured my sisters Marilee, Peggy and me relaxing on the lawn while my mother Sally brought us a plate of freshly baked cookies. This piece was created for cat lovers as 14 of them are sprinkled throughout the artwork. Browne’s Addition just west of Spokane’s downtown corridor was the first residential neighborhood in the community, developed in the late 1800s. Grand Tudors, Victorians, colonials, mission-revival and multi-floored foursquare-style mansion were built on each block surrounding Spokane’s first park, Coeur d’Alene. Dotted between the grand mansion were a few more modest cottages like the Phelps House and this charming little Dutch Colonial home. When my mother Sally and I were walking around the neighborhood in the early 2000s, she pointed out his little "gem" of a cottage ~ and this “Darling Dutch Colonial” painting came to be. Highlight ~ I gave the piece a “May Day” theme ~ and pictured my mother and me delivering pots of pink petunias to the owners in honor of the day. I’ve loved this beautiful old mansion since my first visit as a Campfire Girl in the mid-1950s. In those days it was the Cheney Cowles Museum ~ about to begin a remarkable journey of restoration to become the historic focal point of the Northwest Museum of Arts & Culture ~ or simply the MAC (NorthwestMuseum.org). I painted a glimpse of the guest rooms and linen room with its sewing machine (also pictured above) on the second floor and the library, reception room and servants’ dining room on the main floor. Our “kittiewinks” were placed in the foreground, waiting to enter the historic Tudor with my husband Doug and mother Sally, who introduced me to the Campbell House those many years ago as a Camp Fire Leader. I dedicated this painting to her. Highlight ~ Our beautiful kitties Andy and Sophie passed away a few years back, but they still find their way into many of my paintings. We miss them. I painted this portrait of the Campbell mansion’s exquisite signature yellow guest room and filled it with large bouquets of matching yellow daisies. Crystal vases adorned the occasional tables, fireplace mantle and chaise lounge headboard. This comfortable room was one of two guest rooms and features an enormous fireplace at the west end of it further enhanced by yellow subway tile. Particularly noteworthy was the original family-owned tufted upholstered chaise lounge with a similar armless chair by the vintage steamer trunk. Trunks of this sort were normally necessary for the wealthy during this golden era to accommodate large wardrobes when traveling. Highlight ~ My favorite detail of this inviting setting has always been the cushioned window seats that overlooked First Avenue, offering a cozy place to relax with a good book on a rainy day. Amasa and Grace Campbell slept in this spacious master bedroom on the second floor the northwest corner of their three-story Tudor-Revival mansion. It was decorated with pretty floral wallpaper and carpeting, had a private bath ~ and enjoyed the same beautiful view of the Spokane River as daughter Helen’s room adjacent to it. Remarkable was the doorway behind the standing mirror adjacent to the fireplace, which led to a windowed sun room. When Amasa Campbell was still alive, this was a small deck above the veranda, but upon his death in 1912, his wife expanded the veranda and added this enclosed space adjacent to her bedroom. It may have been a sleeping porch or perhaps a morning room where she planned meals and other details of running her household and tended to her daily correspondence. Highlight ~ I always thought this lovely bedroom suite was the prettiest in the house. Regardless of what season it was, it alway felt like spring here. Tucked into the southeast corner of the second floor, this room caught the morning sun and must have been a cheerful place to be on sunny days. 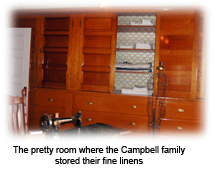 The north wall had built-in shelves and drawers for storing the bed and other fine linens that a fine residence like the Campbell House required. Grace and Helen stayed abreast of the latest fashions and shunned ready-to-wear. They visited several salons in New York and ordered garments from there, Boston and San Francisco. Highlight ~ The dress pictured to the far right of the piece was Helen Campbell’s wedding gown. Entire South Hill Collection pdf ~ Click on the 16-page pdf to see all 76 images. The historic Coffman house on Spokane’s Manito Boulevard was built in 1928 (thus the title) for Charles and Beulah Coffman for a documented cost of $6,000 ~ with an additional $250 for their garage. It has always been one of the prettiest homes on this lovely tree-lined South Hill street. Charles was vice-president and manager of the Exchange and Manufacturing Company of Spokane ~ and it is believed that much of the building materials used in the construction of this classic Colonial-Revival home may have come from the Exchange Company. Charles died in 1947 and his widow stayed here until her passing in 1963 when their daughter Catherine and her husband then owned the property. Highlight ~ One of my clients commisioned this piece as a special thank you gift for the woman who owned this home and raised her family here. The portrait pictured them heading to nearby Manito Park to enjoy a picnic. Even though this two-story rental cottage next door to our bungalow had been subjected to some unimaginative “upgrades,” its “bones” (cat-slide roof, oval walk-through, etc.) were still charming and spoke to me. One day, I was complaining about it to my friend and preservationist expert Linda Yeomans ~ and she shared that she had actually lived in the house as a youngster. A photo from her personal archives inspired me to paint her home the way it looked in the early 1950s. Hearsay had it that our bungalow and this cottage were the last ones built on the block. This made sense as many of the windows, fireplace and other interior architectural details were similar. Ours was completed in 1937 (perhaps the builder worked on both homes at the same time). I pictured Linda and her brother Craig leading the “Celebrate Spring” parade followed by neighborhood pals Sarah and Cathy Albi. Maggie and Sally McCarthy and the three of us Simpson girls. Kitty Boots was “grand marshal” with beagles Jigs and Jigger and kitties Andy and Sophie bringing up the rear. Highlight ~ The girls in the background left (Sher and Chanel Stiller) had been renting this cottage for several years when we moved into the area, so it seemed fitting to include them in the scene. Since its inception, the beautiful Overbluff neighborhood showcased fine residences in several different styles. 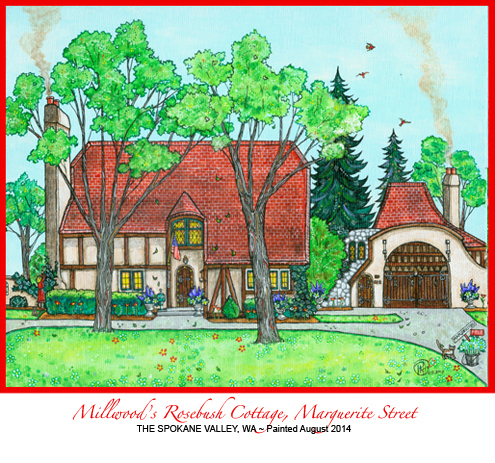 The artwork here portrayed the historic Christensen House ~ a classic Tudor storybook-style cottage from famed architect John Anderson built in 1926. It was listed on the Spokane Register of Historic Places as a historic landmark. The home exuded charm with details like the arched brick border that framed the front door and the tall, tapered chimney. From the intricate wrought-iron porches (a tiny one to the left and a larger one to the right of the entryway) to the cottage windows on all three floors, this stucco house stood out on the block. I pictured the Lundbergs in this springtime-themed piece filled with tulips and trees unfolding into leaf. The Blue Star Creeper “angel” designed into the brick front walkway held a special meaning for the family. Designed at the turn of the century by Kirtland K. Cutter, when I painted this piece, the mansion had served guests for several years as Hannah’s Garden Inn, receiving national publicity in Country Living magazine. When the inn closed, a group of attorneys purchased the mansion and set up their offices there. The mansion’s original owner in 1908 was James M. Corbet who lived there with his family until 1924 when he passed away. The home was then sold to the Conrad Gotzien family who stayed until the late 1930s. In 1938, Dr. Melvin Aspray, his wife Grace and their children moved into the residence, spending over 50 years there. Shawn Nichols and Ann Marie Byrd bought the mansion in February 1999 and spent countless hours that Spring and Summer renovating the place. In Autumn, they opened it as Hannah’s Garden Inn, naming it after their eldest daughter. 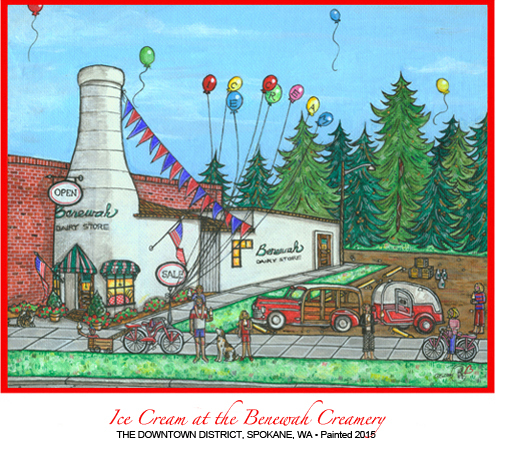 When I was a youngster growing up on Spokane’s South Hill, the weekend began with a stop at the Benewah Creamery’s signature milk bottle dairy store to purchase four gallons of milk ~ enough to last our ever-growing Simpson family for another seven days! 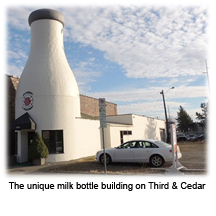 Located on Cedar and Third Avenue, the creamery served the community until 1978. It was one of two structures (originally six were planned) designed by the architectural firm of Whitehouse and Price ~ famous for the Hutton Settlement and other important local buildings. These were built with a fairly hefty price tag of $3,700 each for the times. The North Side bottle building was constructed on Garland Avenue in 1934 and the one pictured here on Cedar Street in 1935. The Great Depression may have been the culprit that allowed for only two of the half dozen planned. I gave this piece a 1950s theme, including a Ford “Woody” station wagon and vintage teardrop trailer in the parking lot. Highlight ~ The Benewah Creamery milk bottles shone throughout the decades as fine examples of “literalist” architecture ~ functioning beautifully as their own advertisements. 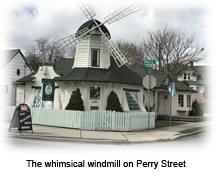 The historic Cambern Dutch Shop was one of several windmill buildings constructed by Charles Wood ~ once employed by famed architect Kirtland K. Cutter. 13 of these novelty commercial architecture” structures were designed and 9 were built. This one at 1102 South Perry was in immaculate condition when I painted its portrait. In the mid-1920s, brothers Robert and Cecil Cambern housed their bakery/dairy business in the windmill buildings until they closed in 1934 due to financial failure brought on by the Great Depression. 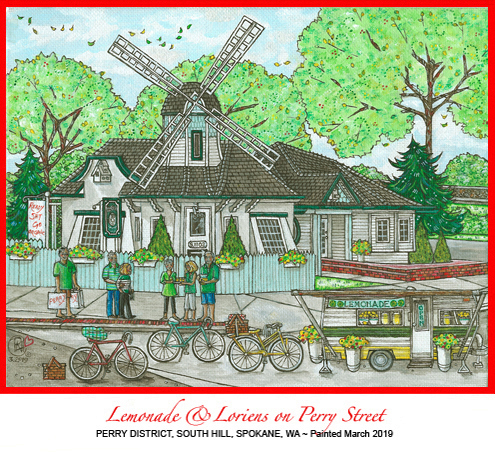 When I created this artwork, Lorien Herbs & Natural Foods (LorienHerbs.com) had been doing business here since 1977. In keeping with the vintage theme of this piece, I paired the windmill with pal Linda Ebner’s campy green and yellow trailer, dressed as a friendly lemonade stand. This was created to honor her milestone birthday and she’s pictured with her husband and lifelong friends. Highlight ~ Spokane’s Perry Street windmill was added to the National Register of Historic Places. This was the fourth painting I created of Saint Augustine’s parish ~ honoring it in all four seasons. Although the parish was formed in 1914, this structure was the second church that served the folks who worshipped there. Designed by the John Maloney architectural firm, it opened its doors in September 1950. Pastor Stephen P. Buckley spearheaded the creation of stunning terraced gardens honoring the seven sorrows of Mary, but the flower beds that framed the church were equally lovely. Planted with dozens of tulips, I painted them in full bloom here ~ a breathtaking backdrop for the spring celebration of family and friends pictured in this piece. Highlight ~ The folks attending Mass were the McCarthy girls Maggie and Sally as youngsters in the yellow dresses; the Arpin family; niece Kelly Barton and her husband David; daughter Leah, husband Sean Davies and sons Connor and Nathan; and my sisters Marilee and Peggy and me as youngsters on the bench in the background. 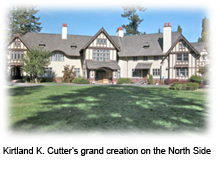 Designed by famed architect Kirtland K. Cutter, this English-style half-timbered Tudor residence was built for F. Lewis Clark in 1898. The rear grounds of the walled estate also included a water tower ~ a glimpse of which was shown in this painting. In 1909, the house on Seventh Avenue was sold to the Burgess Lee Gordons who donated “Undercliff” to Bishop Charles D. White in 1929, and it opened as “Marycliff,” a private high school for girls. This building was named Gordon Hall and served the students as the music center. Marycliff High School celebrated “Mother Mary Day,” a coronation festival held every May in spring ~ the theme of this piece. The school closed its doors for good in the early 1970s, leaving its students and faculty with decades of fond memories. The beautifully preserved building later became an office building, taking the name of “Undercliff” again. Highlight ~ At one point in time, the Clarks had a small three-hole golf course installed on the property between their estate and F. Rockwood Moore’s nearby mansion. 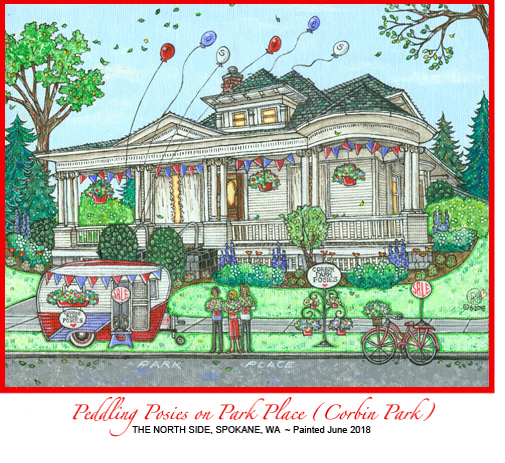 The Corbin Park Historic District has always been a remarkably pretty pocket of homes on Spokane’s North Side. The park’s property once served as the Washington-Idaho Fairgrounds and Racetrack from 1886 to 1897 before it became Corbin Park. Noted landscape architects, the Olmsted Bros., shared ideas to enhance the park’s original plan. Most of the residences were built before 1927 once the racetrack became the park. Daniel Corbin platted the neighborhood in the early 1899, and visitors here have found everything from imposing three-story Victorians to charming cottages like this one on Park Place. I fell in love with the pretty place when shooting photos for SPA’s 2018 Autumn Tour of Historic Homes. 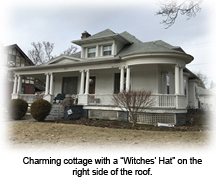 The “witches hat” on the right side of the roof and wrap-around porch were unique architectural touches. I painted blossoms everywhere in this piece and added the vintage trailer and Schwinn bike. This artwork pictured pals Peggy Caprye and Jeannie Fruci with me ~ our arms filled with flowers, of course! Highlight ~ The Corbin Park District has been named on the Local, State and National Registers of Historic Places. 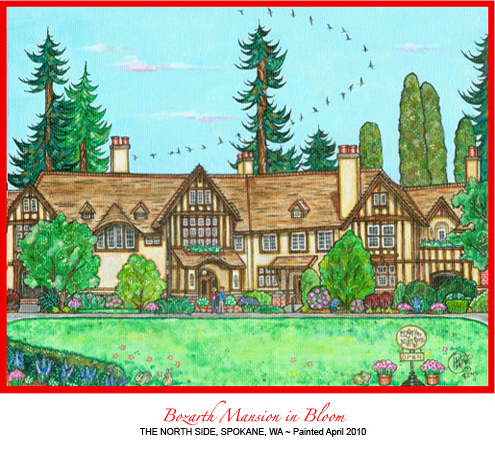 This was a portrait I completed of the historic North Side home built for Harry and Katherine Bleeker in 1909. A Dutch descendent, Bleeker was once secretary/vice president of Spokane's Washington Water Power Company. Famed architect C. Ferris White designed the home in the Dutch Colonial Revival style, influenced by 1700-1800s farmhouses in New York's Hudson River Valley. Architectural details included multi-paned windows, louvered shutters and rare flared-roof eaves. Owners of the home at the time of the MAC (Northwest Museum of Arts & Culture) Mother’s Day Tour of Historic Homes in 2009 had completed a remarkable renovation ~ bringing the residence back to its authentic period beauty. It was listed on the National Register of Historic Places in Spokane. Highlight ~ One of my high school Holy Names Academy classmates, Heather Hennessey, grew up in the magnificent home overlooking the Spokane River and historic old Fort George Wright. This pristine white clapboard three-story residence (pictured above after a very ambitious restoration) was known for years as the Hennessey House. It was accented with blue trim and shutters was designed in the Dutch Colonial Revival style by famed architect C. Ferris White and called the Hennessey House as it was home for decades to the Harry Hennessey family. Daughter Heather was a classmate of mine when I was attending high school at Holy Names Academy. Located on West Point Road, what may have been the shortest street in Spokane, it was perched on a cliff overlooking the Spokane River valley below. Highlight ~ When I was working on this piece, Heather shared that her mother decorated the front porch with masses of potted geraniums every spring, so I pictured Heather, me and beloved Hennessey family pooch Woofy carrying on the tradition. This comfortable split-level friendly family residence was built in a pretty suburban neighborhood on the North Side near Indian Trail Road in the 1980s on Sally Court. It became the home of good friends Jim and Linda (Wamstad) Dean. Linda was a classmate of mine at Holy Names Academy, joining our student body in our senior year. In 2010, Linda and I reconnected at a class reunion party held on Whidbey Island at Kathy Ryan Gould's summer home there, and I shared with Linda that Doug and I had plans to relocate back to Spokane in 2012. After the move, Linda and Jim did everything they could to make us both feel welcome at home here, making our first year back in this community an easy transition after decades spent in the Seattle area. Linda generously opened doors for me as a fine artist, invited me to join her knitting and book clubs, PEO ~ and loaned Jim to Doug and me for afternoons on the golf course. Highlight ~ For her warmth and friendship, a portrait of Linda's home and family of three (painted when they all a couple of decades younger) was the perfect way to share my gratitude. Construction began by John Huetter on Gonzaga University’s (Gonzaga.Edu) first and oldest dormitory on 1925. A stonemason and brick layer, Heutter also built College Hall and the Huetter House ~ the old Bishop White Seminary which became the G.U. Alumni House decades later. At a cost of $98,000, the men-only facility originally offered students 72 double rooms. In 1924, Gonzaga mounted the acclaimed passion play “Golgatha” for Spokane and raised $7,000 towards the cost of the dorm’s construction. 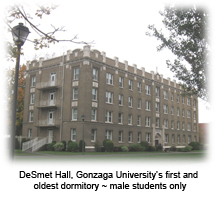 On October 25th, 1927, DeSmet Hall opened, followed by a football game between Idaho and Gonzaga. Gonzaga won 12 to 3 and funds from ticket sales also went to the building fund. Highlight ~ Rumor had it that famous crooner/movie star Bing Crosby was kicked out of school when he threw a piano out of DeSmet Hall ~ untrue as he had moved to Hollywood, California in early 1924 construction began on the dormitory. In 1911-1913, this mansion was built for historic Spokane developer J.P. Graves by the renowned local architect Kirtland K. Cutter for about $100,000. The famed Olmsted Brothers of Brookline, MA designed the extensive gardens and underground water system. In addition to owning one of Spokane’s trolley lines, Graves was also reputed to have the largest herd of jersey cattle on the west coast. The estate was originally called “Waikiki” in honor of the island Graves visited in the Hawaiian Island and also because of the nearly two-dozen streams that ran through his property near the Little Spokane River (“Waikiki” means lots of rushing water). In 1963, the mansion was purchased by Gonzaga University (Gonzaga.Edu) and began functioning as its retreat center. This setting has also hosted dozens of weddings over the decades when not functioning as the retreat center. Its gardens were legendary. Highlight ~ In the 1960s, our family lived next door to the Bozarth family ~ distant relaives of the folks who owned this property after J.P. Graves. Once known as Gonzaga High, from early years it had a solid relationship with Gonzaga University. Gonzaga High was located within the college at one setting or another wherever the institution moved ~ and some years, the tuition from its considerable student body helped keep the college afloat. The high school split from the college administratively in 1926, but the permanent move to Euclid Avenue did not occur until 1954 after Father Gordon Toner, S.J. purchased 85 lots that ultimately comprised the campus. Ground was broken in 1953 and a year later, Gonzaga Preparatory School, Inc. began teaching its 610 male students. In 1975 with the close of Holy Names Academy (Marycliff High School followed in 1979), Gonzaga Prep opened its doors to women. Also history making, in the late 1980s, Gonzaga Prep became the first Jesuit school in the United States to hire a lay president. When I painted this artwork, John Traynor’s longtime successor Al Falkner was completing his 43rd and final year of service with plans to retire at the end of the 2016-2017 school year. Pictured on the right (front to back): Al Falkner, president in his last term; Joe Feryn, counselor and track coach; Phil Kuder, teacher and golf coach; and Fr. Peter Byrne, S.J., Superior Manresa community. Highlight ~ This campus view inspired by Al, pictured the old school building, the Barbieri Student Center and the Chapel of the Three Companions with students enjoying a break between classes. 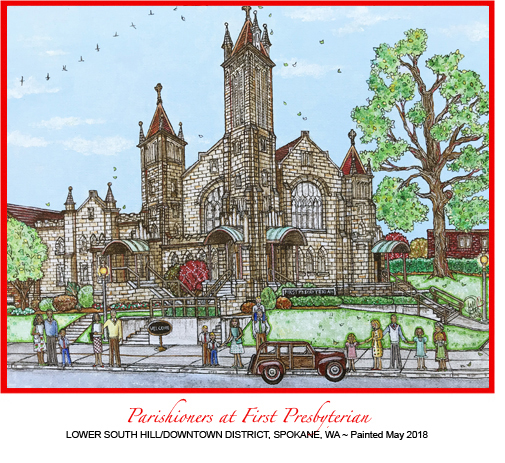 This piece portrayed majestic Saint Aloysius Catholic Church which served both the North Side’s Gonzaga University students and faculty as well as folks from every neighborhood in Spokane who count themselves as parishers of this church whether they live near it or not. The setting for hundreds of weddings, christenings, funerals, baccalaureates, first communions and confirmationas over the many decades when it has stood in place, this church has always been loved by many. The stunning structure was designed by famed Spokane architect Herman Preusse at the turn of the last century. It's spires are a huge iconic signature identifying Gonzaga Universityon Spokane's skyline. Saint Aloysius has served as subject matter for many fine artists in the Inland Northwest. When I was a high school student in the late 1960s, Holy Names Academy and Gonzaga Preparatory High School also held important religious celebrations here like Baccalaureate Mass. I pictured Jesuit Priest Father Tony Lehman in this piece visiting with the Joseph Doohan famiy after Sunday morning Mass. 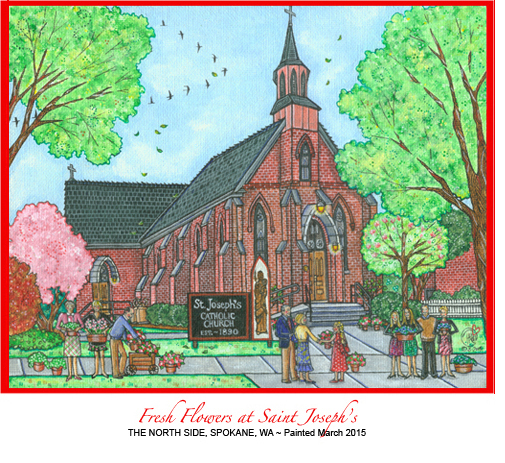 Highlight ~ Joe Doohan commissioned this painting for the March 1997 St. Aloysius parish auction. This artwork was a revision of an earlier painting specially created to honor the 125th anniversary of the arrival of the Sisters of the Holy Names to Spokane, Washington. It pictured the beloved Holy Names Academy and dear friends (teachers, classmates, my two little sisters and me) at the campus of this beautiful old red brick Victorian structure. The building functioned as a “normal school” (teachers’ college) before it became a private Catholic school for girls. Located a few blocks east of St. Aloysius Church, HNA closed its doors in 1975. The empty building sank into disrepair until 1987 when it was developed by Henry A. Green into “The Academy,” a non-denominational full-scale retirement community. I painted this portrait of Saint Joseph’s Catholic Church to honor its 125th birthday. Jesuit Leopold Van Gorp purchased the West Central neighborhood property at the corner of Dean Avenue and Walnut Street in 1890 and sold it to the Corporation of Roman Catholic Bishops of Nisqually, Washington Territory. A frame church was originally built on the site, but as the parish grew, German-born Julius A. Zittell (named Washington’s “state architect” in 1987) was tapped to design a new church and later a convent. The church was constructed in 1901 of brick masonry in the Late Gothic Revival style and the convent in 1924 in the Collegiate Gothic style. This church featured many fine Gothic architectural details including its handsome steeple, stepped buttresses and beautifully detailed stained-glass windows. It was enlarged in 1909, but other than that, very few exterior alterations were made over its more than 100 years of service. 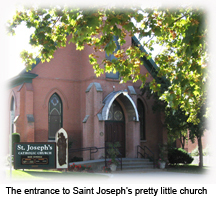 Only Our Lady of Lourdes (1881) parish held the distinction of being older than Saint Joseph’s in the young, thriving community. Rail car #988 was commissioned by Ohio’s Barney & Smith, Co. and beautifully detailed by the Pullman Car Company of Pittsburg, Pennsylvania in 1906. The luxury dining car served the Northern Pacific Railroad’s Yellowstone Route until its retirement in 1920. Before it became a diner, the rail car served during World War II as an induction hall for the armed services. Years later when Jack Knight left the elegant Davenport Hotel to open his own business, he converted the fine old dining car into his restaurant ~ thus the name Knight's Diner (KnightsDiner.com). Located in Hillyard (incorporated into Spokane in 1924), in 1989, new owners moved the rail car to its current location on Market Street shown in this artwork. They added new paint, polished all the original fixtures and opened for business. Located near Esmeralda Golf Course, this piece pictured the owner welcoming a group of lady golfers ~ me, sis Peggy Barton, mother Sally Simpson, niece Kelly Barton and pals Molly Roberts Hannan, Rita Drake and Carmen Perkins. In the foreground, I pictured friends Linda Ebner and Maria Herbert ready to bike home with their breakfasts as husband Doug arrived to treat our grandkid junior golfers Addison and Austin to a meal. Highlight ~ Recently, I learned that my childhood chum Patty Edwards Hayenga's family owned the diner for a number of years when she was growing up. She shared that her father designed the café's signature sign picturing a knight on his steed poised for battle. 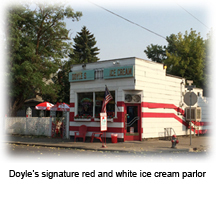 Located in the midst of Spokane’s West Central neighborhood on the North Side on the corner of Boone and Nettleton, this whimsical red and white signature “landmark” was built in 1939 as the Pacific Northwest was climbing out of the Great Depression. For decades, it overlooked the trolley line tracks on Boone Avenue that carried passengers to and from beloved Natatorium Park. It was a favorite spot for folks to stop and purchase ice cream treats. Nat Park closed in 1968 and its site became the San Souci Mobile Home Park. The West Central area fell on difficult times, making it quite a challenge for the little ice cream shop to say alive. Years later in the 2000s, the Kendall Yards development began to take shape. This new neighborhood overlooking the Spokane River from the north bank helped to breathe life back into the ice cream shop. It was recently spruced up with a shiny new coat of paint and other improvements. 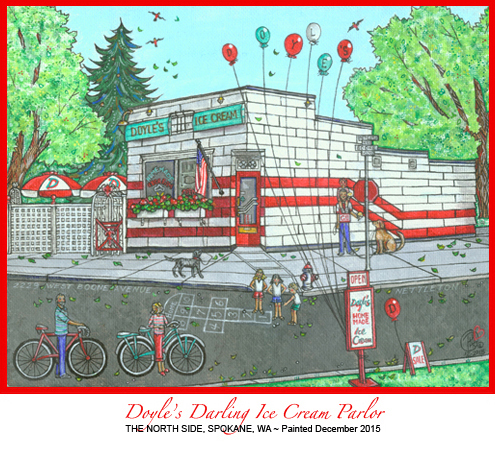 Highlight ~ From the thirties on, Doyle’s always had a reputation for its delicious homemade flavors, but in 2013, the parlor was voted #6 for the finest ice cream out of 11 establishments. Entire Spokane Valley Collection pdf ~ Click on this 4-page pdf to see all 17 paintings (5 of the Barton Snow Fort and 12 others). The handsome, Florentine-style Cliff House was built to take advantage of the view of the Spokane Valley. It was designed and built by Royal Newton Riblet in 1924. An inventor and mechanical genius, Riblet’s estate was filled with marvels for its time like his garage with its mechanical door. He also installed a waterfall that recycled water back to the top of the falls and a life-size chess game on his grounds. 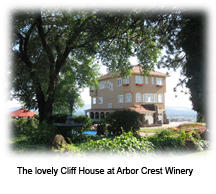 The property with its three-story mansion, basaltic rock out-buildings and marvelous gardens later became the headquarters of Arbor Crest Cellars (ArborCrest.com). Highlight ~ When Royal Riblet was living there, the cement factory far below on the riverside spewed harmful dust into the air, deteriorating his mansion’s facade. He sued ~ and the attorneys who won the first ever case of its kind were associates James Winton and my father Joseph A. Simpson. 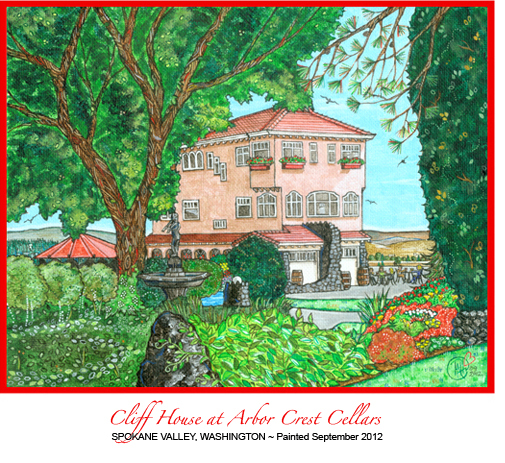 This arched basaltic rock gatehouse on the campus of Arbor Crest Cellars (ArborCrest.com) has always been the signature welcoming structure leading to the handsome Florentine-style mansion known as the Cliff House ~ shown to the right side of the gatehouse. The estate was the home of Royal Riblet who built Cliff House in 1924. The gatehouse was just one of several stone out-buildings on the property. Another was the structure where folks waited to board the tram that carried them down the hillside to the valley below. Riblet was a famous mechanical genius, best remembered for inventing the chair lift, which upgraded the experience of snow skiers everywhere. Now the home of Arbor Crest Cellars, this piece portrayed the Art & Glass Fest, the much anticipated annual summer art event hosted on the grounds of the property. Highlight ~ When I met the owner of the property in 2015, Harry Milke shared that the stone arch once served as the servants’ quarters. This Tudor-influenced Norman-Revival cottage was built in 1923 by Waldo Rosebush, general manager of the Inland Empire Paper Company. The paper company was Millwood’s largest employer for nearly a century. Rosebush had spent time in France during World War I where he discovered the prototype for this finely detailed, beautifully crafted cottage in the Argonne Forest. He purchased the architectural plans from the French owner and built his home a short distance from the main thoroughfare through Millwood, aptly named Argonne. In 1936, Rosebush left the mill to work with the army in Alaska and the Pacific, ultimately retiring to Appleton, Wisconsin. 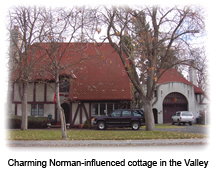 However, he loved his charming cottage so much that he kept it as his official residence ~ returning annually to visit friends and vote in Spokane’s local elections until he passed away in 1961. Highlight ~ This cottage was built in a tiny pocket of historic homes just off Argonne a few blocks from the paper mill in Millwodl. It was probably the most noteworthy residence in the Spokane Valley other than Royal Riblet's Cliff House at Arbor Crest (pictured above in this section). This piece pictured a detail of a large 16x20-inch painting of an imaginary neighborhood sharing homes I’ve lived in and loved over the years. I originally painted it in March 2007, but altered it several times to include grandchildren and changes made to our bungalow property since them. This detail showed our family's 1960s mid-century modern ~ I've painted it three times and it's my mother Sally’s favorite out of all the homes our family shared. When Bernard Street on Spokane’s South Hill was widened into an arterial, my folks Sally and Joe packed up us kids and headed to the suburban Spokane Valley ~ settling east of Spokane at the foot of Tower Mountain. Our new neighborhood Kokomo was filled with playmates of all ages and I have kept in touch with many of them over the years. This piece pictured my brothers Bob (with our dogs, Chum and Andy), Bill and John in the foreground and my sisters Marilee and Peggy (best buds to this day), just returned from a bike ride. Summer meant "al fresco" dining on the front deck of this house, so I painted with my parents and me preparing dinner. Highlight ~ After my folks sold this place, the home has been very fortunate over the years with an owner who clearly loved it, keeping it in "spit-spot" shape and adding improvements like a beautiful water feature in the front yard. It has always been particularly stunning at Christmastime. Entire Greater Inland NW/North Idaho Collection pdf ~ Click on this 4-page pdf to see all 16 paintings. The Arpin Family (L-R Lori and Greg with daughters Sarah and Megan) pictured in this home portrait, founded their beloved home in Hangman Valley in 1992. 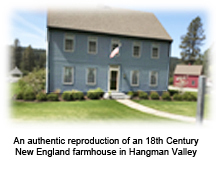 Architect McKie Wing Roth (state of Maine) and builder Gene Plett created this authentic reproduction of an 18th Century New England farm where the family lived for 28 years. The family was joined by their Golden Retriever Grace, kitties Milly and Lilly, and a flock of buff-colored hens ruled by the rooster, Bob Dylan. A farm indeed, the Arpins planted maple (thus the name), oak and spruce trees, a small crop of alfalfa, a vineyard, an apple orchard and a truly lovely enclosed garden of raised beds with a greenhouse. Additionally, the farm had a little red barn, a pool and pump house with special touches like a black school bell (Lori was a teacher for decades), a cannon, weather vanes, birdhouses and toile curtains that dressed the windows of this remarkable home. With Megan and Sarah married and retirement looming for the couple, it was time to downsize to a smaller cottage near Cannon Hill Park. 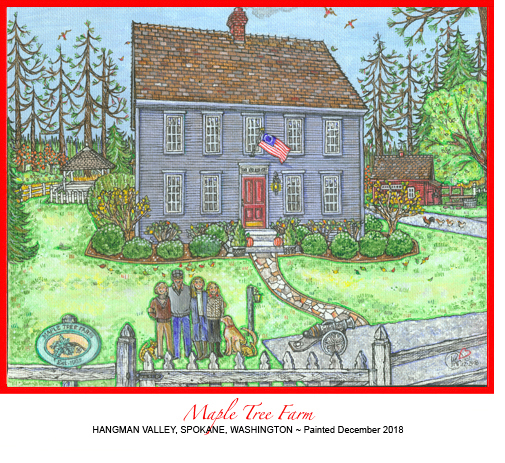 Highlight ~ To honor their wonderful life in Hangman Valley, Lori commissioned this memory-filled portrait of Maple Tree Farm. In the 1990s, this rustic log store located in the town of Hayden Lake was THE spot for bait, lures, rods, shells ~ and every possible gift item for the outdoor sports enthusiast. Charming and cozy with the shop's walls covered with vintage outdoor treasures, folks passing through the community on their way to Spokane or all points east and north usually left the area with a fine memento of their time spent in the North Idaho "Panhandle" ~ thanks to the Cast & Blast. I painted my sisters, Peggy, Marilee and myself in full fly-fishing gear ~ from vests to boots ~ in front of the shop. This was a bit of a stretch, as our summers spent for decades at Hayden were more about sunbathing, water skiing, and cruising around the lake in one of the mahogany Century boats so prevalent there in the 1950s and 1960s. Sadly for all its customers, a short time after I painted this portrait, the unique shop locked its door for the last time. The owners retired to enjoy all of the activities their mercantile had supported for so many years ~ off to fly fish at some nearby pristine setting. Highlight ~ Time moved on and this area became part of a shiny new strip mall, but many "lake people" remember this tiny destination fondly. Rockford Bay on Coeur d’Alene Lake was the setting for this lakeside portrait of family and friends at one of many 4th of July celebrations. Note the flag billowing from the deck and colorful pots of red geraniums. Purchased in the early 2000s, this beloved vacation home hosted years of fun times, creating unforgettable memories for the family who owned it and nearby friends. There was always something to do on the property ~ from “home improvement” cabin projects to puttering on the beach to sunny days on the dock and lake in the Supra. Pictured in the foreground was a friendly gang of good friends enjoying music by the beach fire while the golden retriever kept them company from the dock. Highlight ~ This piece was commissioned as a special gift for his folks by one of my brother Bob’s best friends. Both guys LOVE the lake life! The National Chapter of the Delta Delta Delta Sorority began at Boston University in Massachusetts on the eve of Thanksgiving in 1888. On December 14th, 1918 Delta Delta Delta opened its doors at Washington State University in Pullman, Washington to become one of the prettiest, most popular houses in the Greek system at that university. Allison Orrico, a student there (and daughter of good friends, the Mark and Janis Orrico), suggested the handsome three-story Colonial mansion as a subject to honor with a portrait. The result was this painting celebrating Spring, sisterhood, lifelong friendships and graduation from W.S.U. 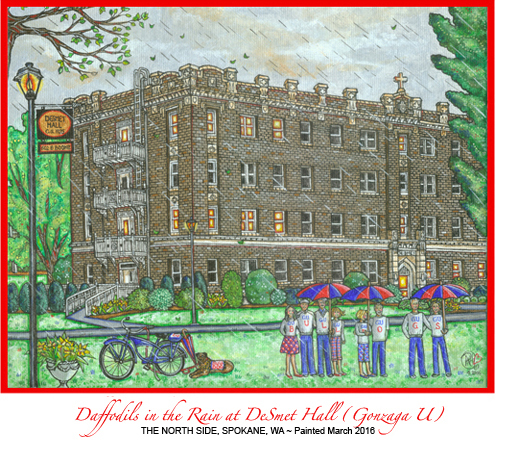 Highlight ~ The painting I completed pictured many of Allison’s sorority sisters in the foreground in front of their beautiful Delta Delta Delta House, honoring their four years of sisterhood together. 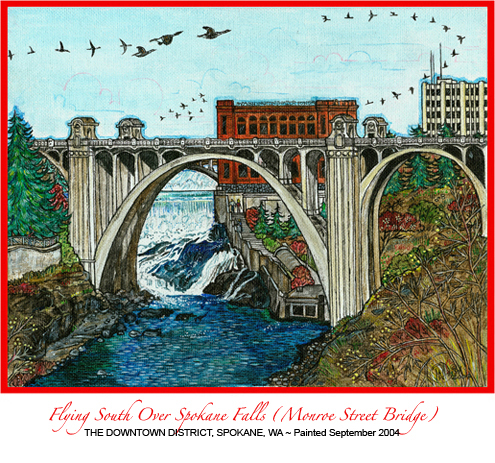 Click on the Red Pointer graphic header here to access "The BIG List" of ALL of the Spokane Collection artwork. Titles are listed in caps alphabetically by group and linked in bold red type to pages throughout this SPRING 2019 edition of the web site.